Writing jointly in State v. Lynch three weeks ago, Justices Shirley Abrahamson and Ann Walsh Bradley observed that, “although we have not done a statistical analysis, our perception is that few of the court’s decisions this term have been unanimous without any separate writings …” Now that the 2015-16 term has expired, we can answer certain questions implicit in the justices’ comment. First, of course: What percentage of the decisions filed in 2015-16 were unanimous with no separate opinions? Second: How does this percentage compare with those for other terms? … And, apart from the issue of polarization, why might some of the justices find this development troubling? As Justices Abrahamson and Bradley suspected, there were very few decisions in 2015-16 that were both unanimous and without separate writings—in fact, only 1 out of 41 decisions, or 2%—and this percentage was several times lower than that for any of the previous seven terms, as Table 1 makes clear. To be sure, part of the reason for the extremely low percentage in 2015-16 is that this term yielded an unusually small number of unanimous decisions of any sort—with or without separate opinions. 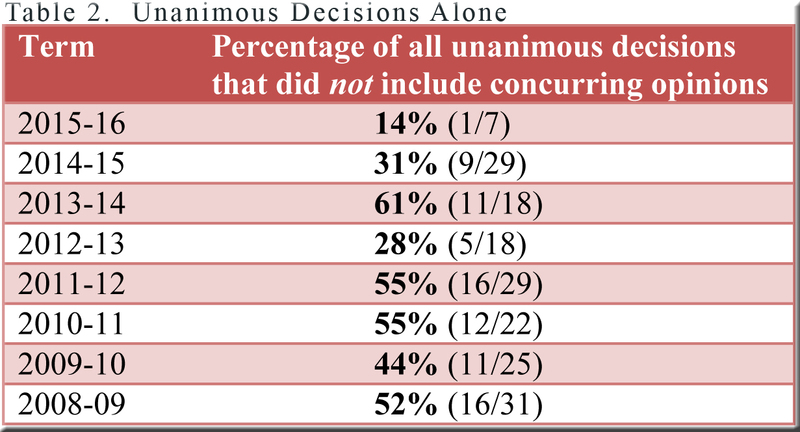 Only seven of the term’s 41 decisions were unanimous, and even if every one of the seven had appeared without separate opinions, they would have accounted for only 17% of the 41 decisions. We could sidestep this difficulty by restricting our attention just to unanimous decisions—that is, we could ask what percentage of unanimous decisions alone included no separate opinions. 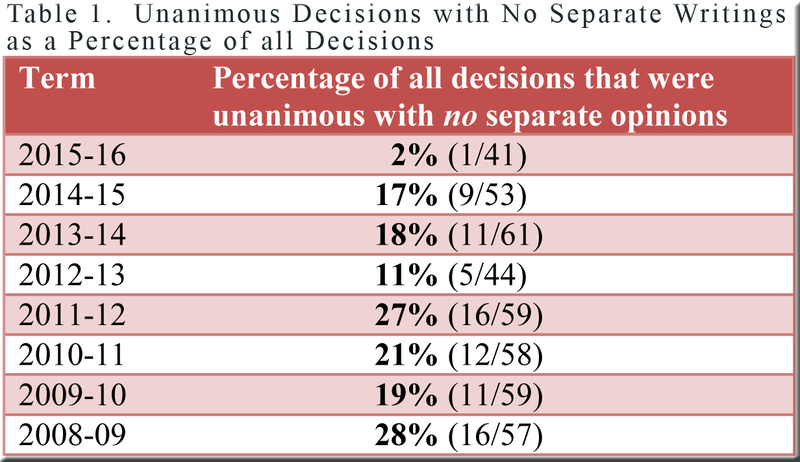 But even here, the percentage for 2015-16 (only one out of seven unanimous decisions, or 14%, had no separate opinions) is much lower than those for the other terms, as evident in Table 2. These tables raise the broader question of whether 2015-16 witnessed an abnormally large number separate opinions generally—dissents along with concurrences—as Justices Abrahamson and Bradley surmised in Lynch when they remarked that a “proliferation” of separate opinions appeared to be “emblematic” of the current term. Measured in raw numbers, this statement would not fit the facts, as the 68 concurring and dissenting opinions in 2015-16 do not stand out among the numbers for other years in Table 3. However, we must bear in mind that there were far fewer decisions in 2015-16 than in most other terms. In other words, there may have been 112 concurrences and dissents in 2004-05, for example, but these were distributed among 93 decisions—in contrast to the 68 concurrences and dissents spread among only 41 decisions in 2015-16. As a result, the average number of concurring and dissenting opinions per decision was considerably higher in 2015-16 than in previous terms. In this respect, then, separate opinions did indeed “proliferate” in 2015-16—most often in the form of dissents from Justices Abrahamson and Bradley themselves, but with enough concurrences and dissents authored by the other justices so that, as noted, 2015-16 surpassed the average per decision of all the other years in the table. This outcome is significant in light of the procedures for opinion preparation and mandate adopted by a divided court in September 2014. Designed to accelerate the filing of decisions, the new rules sought to place limits on the number of days for writing, circulating, and revising opinions, and they did so in a way that appeared to discourage concurrences and dissents. If such was the goal of those who drafted the procedures, the results for 2015-16 must have disappointed them. Not only were there more separate opinions per decision in 2015-16 than previously, the reform’s primary goal of hastening the filing of decisions was also frustrated. 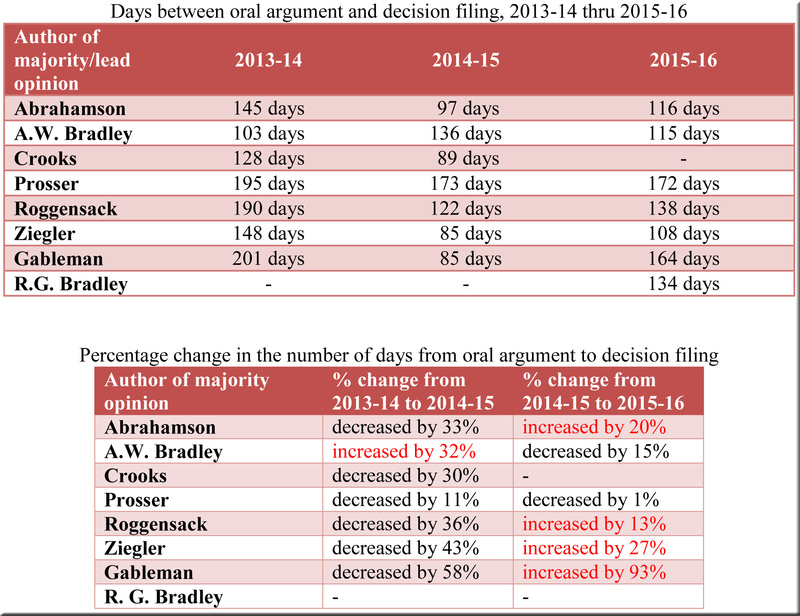 In the first year of the new rules, 2014-15, the average number of days from oral argument to decision filing did decrease—to 112 days, not yet down to the goal desired by the reform’s supporters, but still a substantial drop (31%) from an average of 162 days in 2013-14. However, nearly half of this decline was reversed in 2015-16, when the average climbed back to 136 days. Given the unprecedentedly small number of decisions filed by the court this term, one might have expected that the time from oral argument to decision would continue to diminish. But it did not. To what extent the reversal of this downward trend was due to the frequent separate opinions is difficult to say, but it is plausible to suppose that they played a major part. Finally, the numerous concurrences and dissents certainly accelerated a trend that has been evident for some time—the increasing length of decisions. 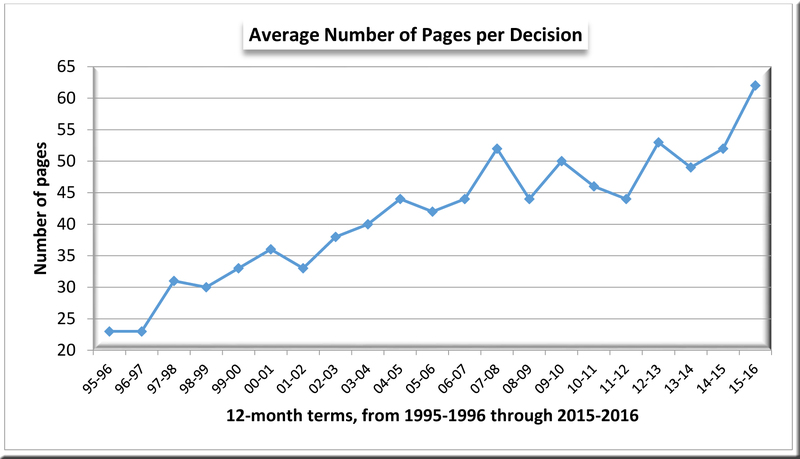 The graph illustrates this durable trend as well as the fact that the largest jump in the number of pages per decision took place in 2015-16, when the average decision required fully 62 pages—approximately 10 more pages than just one year before. Although majority opinions grew slightly in 2015-16, nearly all of the increased length of decisions came from concurrences and dissents. So rapidly did these separate opinions expand that they averaged only seven pages less than the majority opinions that they accompanied, as shown in Table 4. The table covers only five terms, but it would not surprise me if the average length of separate opinions per decision in 2015-16 exceeded the figure for any other term in the quarter century covered currently by SCOWstats—and probably by a great deal. Tables 1 and 2 do not include per curiam decisions. The period 2008-09 through 2014-15 was chosen for comparison with 2015-16, because, throughout this interval, the court’s membership did not change (with the exception of Justice Rebecca Bradley, who replaced the late Justice Crooks in 2015-16). Click here for the number of concurrences and dissents written by each justice in 2015-16. For the number of such opinions written by individual justices during any of the terms covered by SCOWstats, use the “Statistics for Individual Years” tab on the menu bar, then choose the year of interest, and click on the “Distribution of Opinion Authorship” link. Click here for tables providing information on the number of days between oral argument and the filing of decisions for each justice individually. The figures include title pages, majority opinions, and separate opinions. The figures do not include title pages. 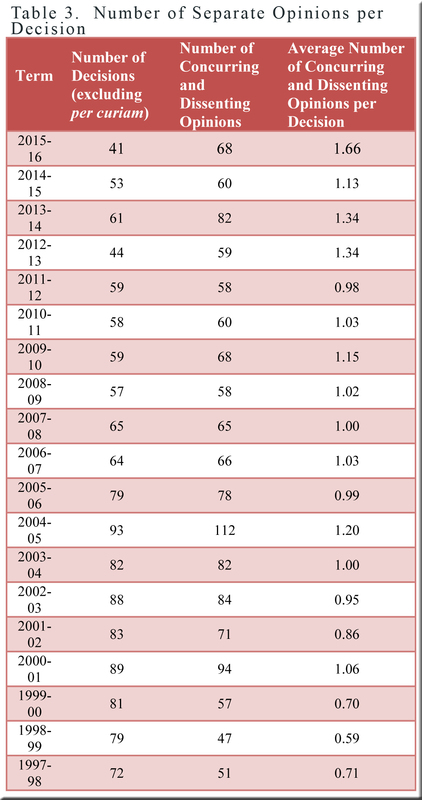 Click here for a table providing figures regarding the length of majority/lead opinions written by individual justices.